a Cosmopolitan b NOTE: This is NOT a project for beginners! such sale, or there after be barred. This one year limitation is imposed by agreement of the parties as permitted by the laws of the state of Georgia. locate Fl with the engine crankshaft, with the spinner backplate mounted on the engine, and glue in place. 20. Now round off the nose to Fl. So that you don't round off too far back it is a good idea to lay rib Rl in position and trace around it with a ball point pen. This will give you an idea where the wing leading edge starts. Provide room for the muffler and needle valve after rounding off and shaping. 21. Locate, drill, and install the front hatch retaining dowels as well as the aft hatch block in the fuselage. Cut these from the 1/8" dowel provided. Drill a 1/8” hole through the fuse sides and into the hatch plates (HP) for the ½” 4-40 blind nut and bolt. Re-inforce the holes in the balsa fuse sides with ca. WING CONSTRUCTION In order to ensure a straight wing with no warps, build the wing panels the following way. The wing spars are installed in the fuselage, the ribs slid in place and then the sheeting and cap strips applied. Began by taping the wing plans down at the edge of the work bench. The wing root, next to the fuselage, should be flush with the edge of the work bench. Using a square, check to see that the spars or trailing edge of the wing on the plans are perpendicular to the edge. The side of the fuselage will be aligned with the work bench edge so it is important that things are square. 1 . Locate a 3/8" sq. x 42” spruce stick and find the center. From the center measure out 11/2” each way and mark. Align marks with outside edges of fuselage. This is the rear spar in the wing. Install it in the middle 3/8" sq hole in the fuselage (the rear most 3/8 hole is for the tail balsa, use the 3/8 hole in front of that one), making sure it is centered, and CA in place. 2. Locate the 3/8” x 24” spruce stick and cut to a 22 1/2” length. Find the center, measure out 1-1/2" each way and mark. Slide this spar in the forward 3/8" square hole (not the diamond shape hole) in the fuselage, under the servo rail, making sure the marks are aligned with the outside fuselage sides. CA in place. 3. Find the sheets with the ribs. Carefully cut them out so as not to break off the tabs. If you do break one off, CA it back on. These tabs are required to space the ribs parallel to the work surface during wing construction. Lightly sand edges of each. Note: When we say cut them out, we mean cut the micro joints that hold them in the sheet. These joints keep the parts in tact on the sheet. 4. Carefully slide Rl rib on the spars and up against the fuselage. Glue it in place with CA but, do not glue the tabs to the sides. These must be removed later. 15. Using the 3/32” sheet cut from the LE, sheet between ribs R1 and R2. To use 2 aileron servos, first install two ¼” x 6-1/4” hardwood rails across the rib bay in the notches, then sheet the bottom wing as shown on the plans. Cut a hole in the sheet for locating the servo, then cut another hole in the side of the fuse to pass the servo wire through. Now sheet the top of the wing. 16. Locate the 1/2" x 1-1/2" x 12" block and cut in half. Stand the wing tip on end and trace the airfoil on one of the blocks. Cut it out and glue on the tip. Sand to shape at final sanding before covering. 17. Now build the other wing panel as described above. 18. Locate the two 7/16" x 2" x 16" aileron stock. Cut and taper them to the configuration shown on the plans, Sand the trailing edge uniform on each. Locate and install the hinges but do not glue them in until the covering has been applied. STAB CONSTRUCTION Building the stab is very straight forward and easy. Make sure the joints fit tight and flush with each other. Very few parts are required. 1. Cut a 11-5/8” length from the 3/8" sq. stick. Install it in the 3/8” hole in the fuselage side against the wing trailing edge. Center it, leaving a equal amount sticking out on each side. Note: The aileron horn set must be installed at this time if you are using 1 servo. Slot the 3/8" sq. stick to accept them and glue in place together with the 3/8” stick against the trailing edge of the wing. 2. Cut four lengths of 3/8” sq. balsa, 7-1/2” long for the side rails and rails against the fuselage. These are cut purposely long and must be fitted between the stab leading and trailing edge. Before fitting them, one side of two of the stab ends must be cut at a 10 degree angle. Use a band saw or table saw. 3. Now fit the two outer end side rails and glue in place, making sure the angle is on the outside. This will allow the fins to cant outward at the proper angle when glued to this surface. Fit and glue in the two 3/8" sq. inner rails against the fuselage 4. Cut and sand the leading and trailing edge ends to match the angle on the side rail on both sides. 5. As indicated on the plans, cut and install the 3/8” tail stringers with CA. Install the front and rear stringers first, then the middle one. 6. Locate the 3/16" sheet G1 gussets and glue in place as shown on the plans. 7. Cut a piece 11-3/8” from the 3/8” x 2-1/4" x 12" trailing edge stock. Shape the ends to the configuration shown on the plans. Sand the angles shown on the leading edge. Install the hinges at the location shown on the plans. 5. Assuming that the fuselage is painted or covered, peel off one side of the tape supplied. Locate one end of the tape at the back edge of the nose block. Place the rest down the center of the fuselage towards the tail. Now pull off the rest of the paper and stick down the strip of plastic on it. This skid will protect the bottom when landing. 6. Assemble and prepare the fuel tank for installation. Cut a l' length of fuel line in two. Place one piece in each of the fuel line holes in the firewall. Pull them through until they can be hooked up to the tank. One on the vent and one on the clunk line. Wrap each line at the tank with a nylon zip tie to hold the lines on. 7. Now grab the two lines at the firewall and pull the tank into position. Mount the tank as high as possible blocking it up with foam. 8. As a start, locate the receiver batteries under the fuel tank. You may find it will be necessary to shift it to another location when balancing at the CG shown on the plans. 9. Mount the throttle servo where shown. Hook up the pushrod using the hardware specified not supplied. 10. Mount the aileron and elevator servos. Hook them up with the hardware specified. It will be necessary to make a slot in the section behind the aft edge of the hatch to accept the elevator pushrod. You will have to put a slight bend in the rod to clear the hatch. If you are using two aileron servos, mount the servos in the wings and run the wires into the fuselage. Use (2) 4-40 control rod and an aileron horn set as shown on the plans. 11. Trim and install the canopy where shown on the hatch. Use Zap New Formula 560 Canopy Glue to hold it in place. If desirable install a pilot of your choice. PRE-FLIGHT NOTES Before the first flight, and to ensure some longevity in your Shrike 40, you will do well to check out a few things before heading to the flying field. 1. Balance the Shrike 40 at the indicated CG point shown on the plans with the fuel tank empty. Depending on your type of flying you may want to adjust it forward some. 2. Check the control surface travels. We have given you a starting point however, they need to be fine tuned to meet your flying needs. 3. Run the engine and check the idle. Have it ready so you don't encounter any problems at the field. 4. Turn on the radio with the engine running to make sure there are no intermittent glitches. Give it a good range check. 5. Check all hardware to be sure it is secure. There is nothing worse than losing an airplane on the first flight because of a lose nut or clevis 6. Always launch with up elevator for reflex action. 7. Hopefully by now you are ready. We know you will be thrilled with your first flight and that it was most successful. From now on - Happy Fly'in! WING 1. (2) sheet 3 (laser cut Rl, R5, and hatch parts) 2. (2) sheet 4 (laser cut R2, R3, and misc) 3. (1) 3/8” sq. x 24” hardwood (front spar) 4. (1) 3/8" sq. x 42" hardwood (rear spar) 5. (2) 3/8” sq. x 36” (leading edge) 6. (1) 1/4" sq. x 42" (trailing edge) 7. (5) 3/32" x 3" x 36" (leading edge, center sheet) 8. (4) 3/32" x 1-1/2" x 24" (trailing edge sheet) 9. (2) 3/32"x 3/8" x 24" (rib capping) 10. (1) 1/2" x 1-1/2 " x 12" (wing tip block) 11. (2) 3/16" x 2" x 24 " (tail fin ) 12. (2) 7/16" x 2" x 16" tapered trailing edge stock (ailerons) 13. (1) 3/8" x 2-1/4" x 12" tapered trailing edge stock (elevator) MISC. 1. 2. 3. MISC. 1. 2. 3. 4. 5. 6. 7. 8. 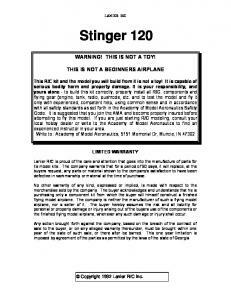 Report "LANIER RC SHRIKE 40 WARNING! THIS IS NOT A TOY! THIS IS NOT A BEGINNERS AIRPLANE"